LINDENHURST, Long Island (WABC) -- Five years after Superstom Sandy, people living in Lindenhurst are still struggling to get their neighborhood back to what it was. "We haven't seen the progress that needs to be seen in year five," resident Michele Insinga said. "There are a lot of people who still have questions to this day and they shouldn't even still have these questions." 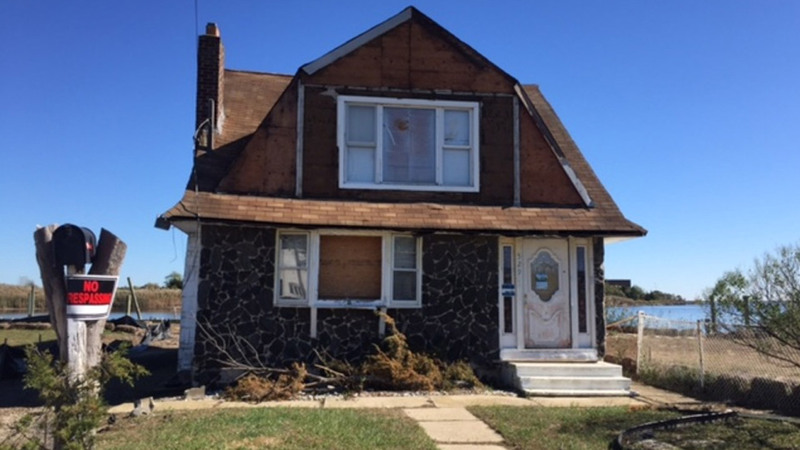 If you drive around Lindenhurst south of Montauk Highway, you'll see homes just now under construction or abandoned all together. Lindenhurst was one of the hardest hit areas on Long Island when Sandy swept through. People there will tell you it wasn't the storm that was the worst part. It's what happened afterward -- the contractor fraud, insurance denials and run a rounds and the empty promises from FEMA. People were forced to watch as their neighbors' perfectly fine homes were torn down and the land sold to the state. Maria Perillo said she was forced to spend $40,000 to bring her house on South 7th Street up to code after the storm, yet she lives next door to two abandoned homes -- one that is filled with mold and raccoons and the other that had a squatter living in it recently. "This house has been sitting here rotting. It's unacceptable after everything we've had to go through," Perillo said. The village of Lindenhurst says it has contacted the property owners and told them they have to clean it up. In the meantime, the people who live nearby continue to wait.